“The nation behaves well if it treats its natural resources as assets which it must turn over to the next generation increased, and not impaired, in value,” declared President Theodore Roosevelt during a speech delivered in 1910. 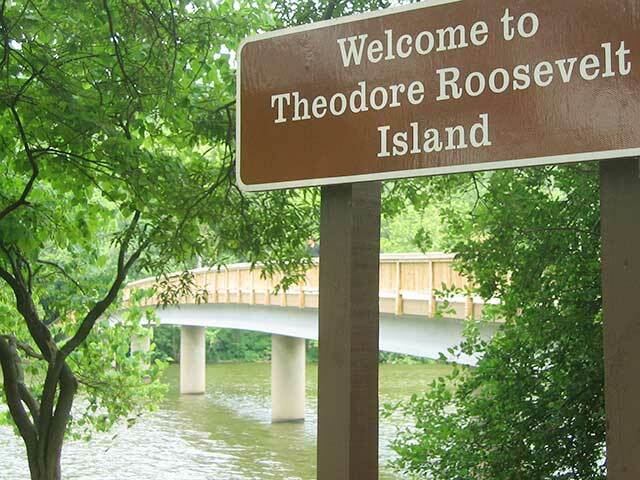 Join a Washington Walks guide and a professional arborist for an exploration of the living memorial to America’s 26th president: Theodore Roosevelt Island, situated midstream in the Potomac River between the Georgetown waterfront and the skyline of Rosslyn, Virginia. The island’s 88 acres encompass numerous ecological zones and species of trees, from the varieties of oaks growing in upland forests to the lowland sycamores and silver maples found at the river’s edge. Yet the island was not always a wild place. For years it was privately owned, the site of one of the first important Neoclassical-style residences in the District of Columbia and later home to the family of Virginia statesman George Mason. A desire to pay tribute to the president whose administration designated nearly 230 million acres of American wilderness for federal protection set the course for the island becoming a National Park Service site. All human-made structures were removed, the island’s landscape restored to natural forest, and woodland footpaths laid out. Follow any one of them and you will eventually find yourself emerging from the forest onto a large, open terrace. In the center stands a 17-foot high bronze portrait of the island’s current namesake, reached by crossing a footbridge over a picturesque moat. Look about quietly. Your sole companions may be a few ducks or a shy deer. Listen to the wind sweeping through the trees punctuated by a chorus of cheerful songbirds. The bustle of the city suddenly feels far away. The spirit of the “Great Conservationist” lives on. Embarks from the Rosslyn Metro station's N. Moore Street exit (1850 N. Moore Street) by the Metro Bus Supervisor kiosk.